Some fans call it The Linc, but whatever people call it, all fans agree that Lincoln Financial Field is a vast improvement over Veterans Stadium. For over three decades, dating back to 1971, the Eagles shared the multipurpose Veterans Stadium with the Philadelphia Phillies (MLB). In the 1990s the Eagles began to want a new stadium for several reasons. Veterans Stadium was considered one of the worst venues in the league, in part because it was known as having the worst turf in football. In 1993, Eagles owner, Norman Braman, wanted to build a new stadium similar to Ralph Wilson Stadium in Buffalo. Braman sold the team to Jeffrey Lurie, who continued the quest for a new stadium in Philadelphia. For over five years, the Eagles struggled to gain financial support for a stadium. In February 1999 the State of Pennsylvania approved funding, and in December 2000 the City of Philadelphia and the Eagles agreed on a deal to construct a stadium. Construction adjacent to Veterans Stadium on a new stadium began in April 2001. In June 2002, Lincoln Financial Group, a financial services firm that has its headquarters in downtown Philadelphia, agreed to pay $139.6 million for the naming rights. 19 players inducted into NFL Hall of Fame including Chuck Bednarik, Reggie White, Sonny Jergensen and Norm Van Brocklin. The Eagles played their first game at Lincoln Financial Field against the Tampa Bay Buccaneers on September 8, 2003. Located at 11th Street and Pattison Avenue in the Philadelphia Sports Complex, the facility looks similar to other NFL stadiums. Nearly two-thirds of the seats are located on the sidelines and are 60 feet from the field. Two three tier grandstands of seats are located on both sides of the gridiron and two tier sections of seats are located beyond the endzones. The stadium features three open plaza corners for views of the city and into the stadium. Atop Lincoln Financial Field, a pair of wing-like coverings protect some fans from the elements in the upper deck but serve to focus stadium noise back towards the field, enhancing the game experience. Video/scoreboards are located between the lower and upper decks in the endzones. 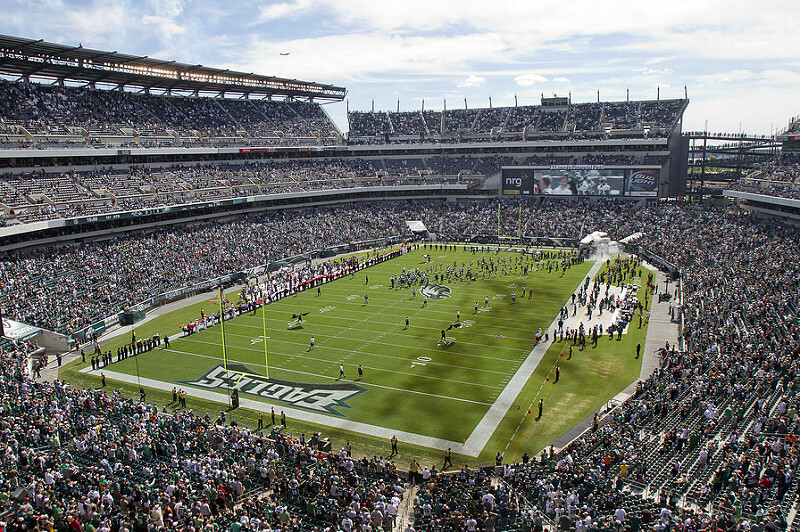 A number of amenities are at Lincoln Financial Field, including 117 luxury suites, 9,000 club seats, a 100,00 square foot fan oriented plaza and an Eagles team store. In June 2013, the Eagles unveiled plans for a two year, $131 million revitalizing project at Lincoln Financial Field. Completed by the 2014 season, the renovation project included the addition of 1,600 seats (800 in the southwest corner, 600 in the northeast corner and 200 in the northwest corner), new HD video/scoreboards in each end-zone, adding pedestrian bridges connecting the upper deck concourses, upgrading luxury suites and adding historical imagery throughout the stadium. 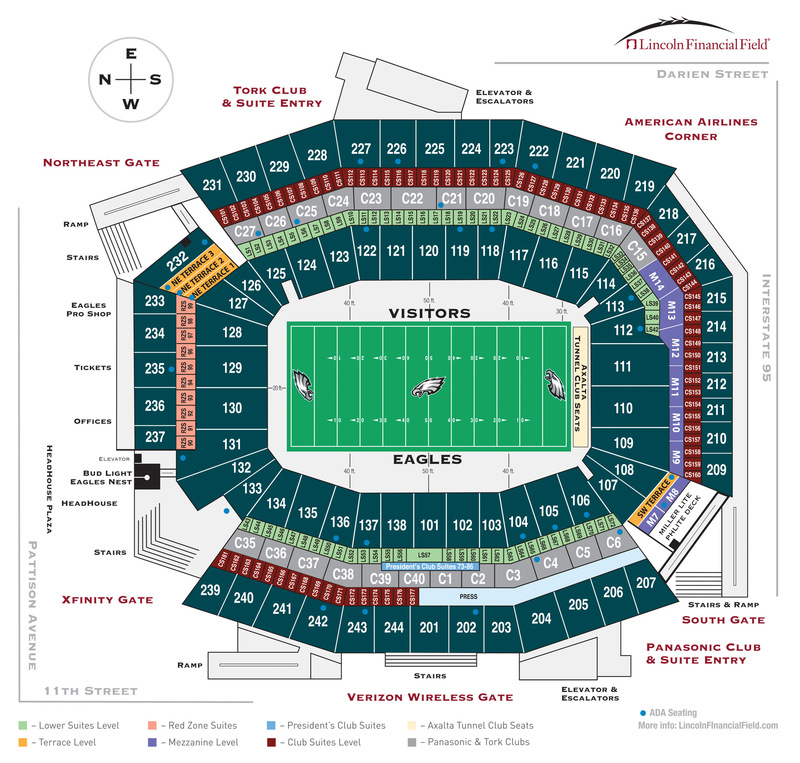 With the completion of this expansion, Lincoln Financial Field now has a seating capacity of 69,176. In 2019 Lincoln Financial Field hosted its first hockey game as the 2019 NHL Stadium Series was played at the stadium on February 23, 2019 between the Pittsburgh Penguins and Philadelphia Flyers.